Bicycle Playing Cards have been helping make memories for over 125 years. Each deck is proudly crafted using custom paper and coatings so consumers can trust Bicycle performance hand after hand. 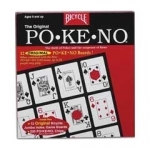 Bicycle Playing Cards have been the easiest to shuffle, deal, and play since 1885. The Joker is an American invention dating from about 1865 and has made different appearances in the Bicycle� line. The first type represented a man on a high-wheeled bike. The bicycle later acquired two wheels of normal size. Then followed a series of playing card kings on bikes. These cyclists wheel past a milestone marked "808." Contrary to some opinions, this number has no mystical meaning. It is merely a reference number distinguishing this brand from others (such as "606") by the same company. 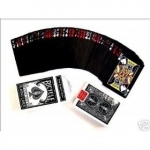 All BICYCLE, BICYCLE Design and BICYCLE Logo, associated marks, numbers and finishes are trademarks of The United States Playing Card Company.